These trick and roman riders have a very unique act! Shanae and Hannah Ritter are sisters which means they practice together. These sisters have a one of a kind roman riding act where they jump their roman teams towards each other at the exact same time!! They have to always make sure they stay in sync with each other to hit the jump at the right time. 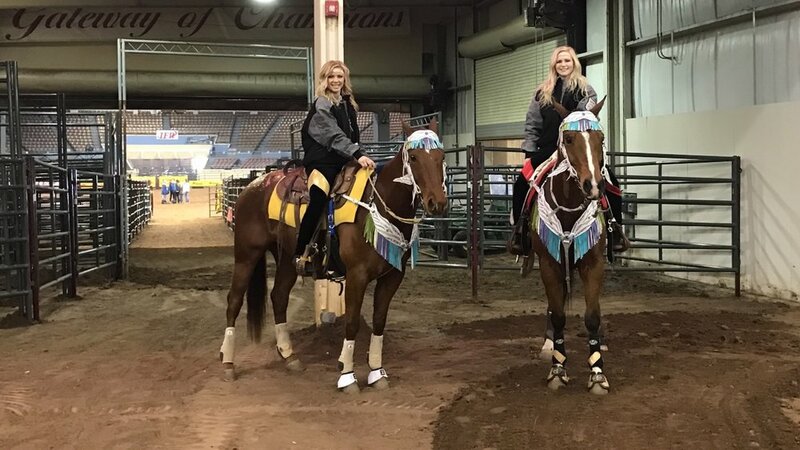 They train their own horses in which Shanae and Hannah have learned from the best. Their trick riding act is very upbeat and fast paced. Wild Together has a special opening act where Shanae carries the American Flag with Pyro. These girls give their all in each and every performance. They are willing to perform in mud, rain or shine! Shanae Ritter from Clinton, IL, born on November 29, 1993, began riding horses at 5 years old. She is the middle child of Roger and Charlotte Ritter who are successful business owners. Shanae is a licensed Cosmetologist and is also pursuing a degree as a Registered Nurse. Shanae grew up learning a variety of equine disciplines. Just at the age of 5 she became a trick rider with a local, professional trick riding team. Later she began expanding her riding knowledge by including english, hunter jumper events, western pleasure, and speed events such as pole bending and barrel racing. During this time she was also an athlete involved in volleyball, track, cheerleading and gymnastics throughout her high school years. After graduating from Clinton High School in 2012 she started trick riding again. Soon Shanae received and accepted a job offer as a performer at the famous Dixie Stampede in Pigeon Forge, TN. Being in front of the audience fueled her desire to make a career out of entertaining through equine performance. During this time Shanae was able to magnify and expand her showmanship though the help of talented performers. In 2013, Shanae moved back to IL and shared her knowledge and talents with her sister, Hannah, with a dream of forming their own speciality act. Although Shanae and Hannah are first-generation trick and roman riders, they're second-generation performers. Shanae and Hannah's mother has her Bachelor’s degree in vocal performance and sings the National Anthem a cappella at rodeos and fairs. Hannah Ritter, born on July 12,1997, began riding horses at 7 years old, and like her sister, was also well-rounded in a variety of horseback riding disciplines. She loves spending time with her family, friends, and animals. Hannah is also a licensed cosmetologist and founded Silver Spur Stables which provides boarding and horseback riding lessons. She is currently going to school to pursue her dream of becoming a Veterinarian Technician. During her years in high school, Hannah participated in sports, band, cosmetology school and other academics. 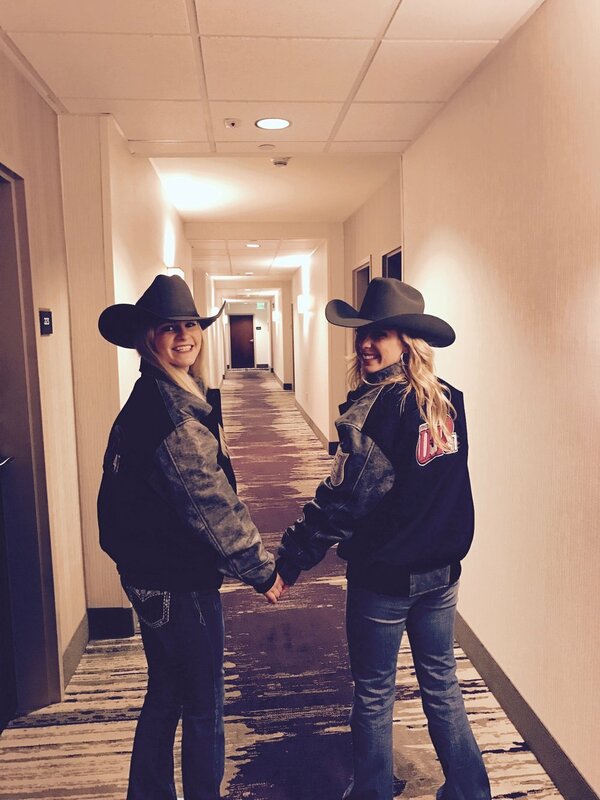 Hannah still found time to become actively involved in the Illinois High School Rodeo Association and competed in pole bending, barrel racing, goat tying, and breakaway roping. After experiencing the rodeo life, Hannah decided she wanted to learn and perform trick riding along side her sister. Hannah and Shanae met their goals and trick rode together at several IHSRA events. This was the beginning of their journey towards becoming a professional specialty act.